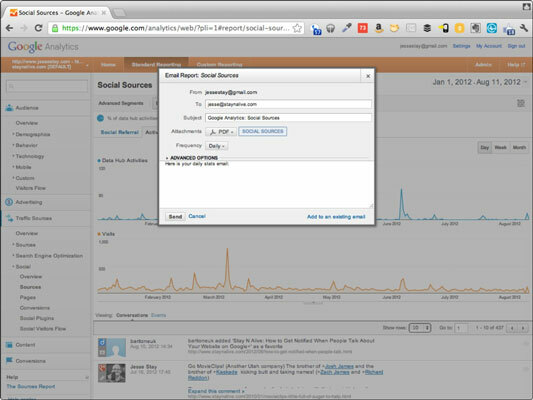 With every report on Google Analytics, web marketers can have Google e-mail you a copy of that report on a regular basis. This can be a useful reminder to keep an eye on your stats when things get so busy that you forget to go in search of the report. If the notification option is available, you see an Email link above the report; click that link. In the dialog box that opens, you specify how you want to receive your notifications. Choose who will receive your notification e-mail. In the To field, enter a single e-mail address or a comma-separated list of e-mail addresses that you want to receive your report. Specify the format of the report that will be attached to the e-mail. Your report gets attached to an e-mail sent to the recipients you specified in Step 2. Presently you can send the report in CSV, TSV, TSV for Excel, and PDF formats. Choose how often to send the e-mail notification. You can choose When, Daily, Weekly, Monthly, or Quarterly. You can also identify days within that repeated time period. Set the duration, by clicking Advanced Options and selecting from the drop-down list. When you click Advanced Options, you can specify how long you want to receive the notifications on a regular basis. Presently you can’t receive the notifications for longer than 12 months before having to reset them. Type in the text you want to appear in the body of your e-mail. This can’t be blank. Put something brief and friendly here (“Here’s your report,” for example), but you can also use this space to describe the report to those who will receive it. Decide whether you want to add this report to an already existing e-mail notification report. You can also opt to just add this report to an existing e-mail so people aren’t receiving more than one e-mail for their website, filling up their inboxes. To do so, click the Add to an Existing E-mail link in the lower right. Your e-mail notification should now be set up, and your first report will be sent out.